G2A.com charity event - let’s save the Ethiopian children together! If you are our regular reader, then you know that each Friday we tell you about the weekly sale from our partner - G2A.com online shop, - on which you can buy lots of games with nice discounts. But today we’d like to share the information about another G2A promotion and ask to pay as much attention as you can. The question is that G2A is a member of the international organization Save the Children, which promotes the kids’ rights all around the world and raises money to help educate them, stop starving and dying because of terrible diseases. And this G2A.com charity event is aimed to gather money for children and young women in Ethiopia. Each year a huge number of children under 5 and pregnant women dies because of starvation in this country. Save the Children organisation has launched the project titled ENGINE, the main goals of which are the provision of the meal and the safe place to live for children and the correct balanced nutrition for pregnant women. Besides it, the employees of Save the Children train the small-holder farmers how to raise vegetables, fruits and other products in order to improve the household consumption and forget about the constant starvation. That’s why, today, we address to all unindifferent people to make their strong contribution in this fight against the infant mortality in Ethiopia and do a donation. You can pay 1 dollar or a thousand - everything depends on your generosity. All you need to do is to go on this page, click on “Donate” and make your contribution. But G2A.com not only fundaraise for this charity event, it also gives you a chance to win some prizes. For each donated dollar you’ll get a certain quantity of points, which can be used for games’ purchasing, but only in case if you donate, being logged into your Twitch accoun. The whole list of these projects is quite long, and here you’ll find lots of really cool and interesting games, so don’t lose your chance to make a good thing for the Ethiopian children and get a nice bonus! 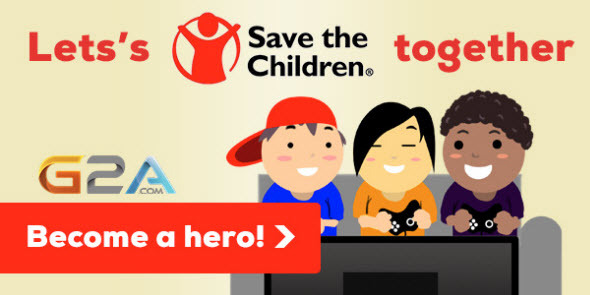 This G2A.com charity event is your opportunity to show your personal involvement to the destiny of millions children.